"Three main risk factors for age-related macular degeneration — smoking, exposure to light, and inflammation — are all associated with local activation of macrophages ... they lead to an increase in photochemically damaged lipids and proteins to induce apoptosis (cell death) of Retinal Pigment Epithelial cells and photoreceptors. " Paulus T.V.M. de Jong, M.D., Ph.D. There are some risk factors for AMD that we can't control, like the genes we inherit, whether we are male or female, and most certainly we can't stop ourselves from aging. Likewise there are risk factors that we can control or minimize - such as quitting smoking, adding more exercise or reducing chronic inflammation. Just like many of you with family histories of AMD, my husband and I are concerned about developing this retinal disease in our own eyes. 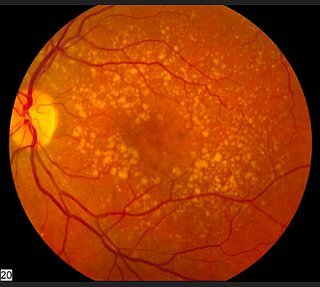 Macular Degeneration - Can It Be Prevented?